The UC Presidential Chair in Feminist Critical Race & Ethnic Studies and the Living Writers Series at UC Santa Cruz will present two evening events with visiting Nigerian filmmaker Branwen Okpako, February 10-11. A free film screening of the acclaimed feminist director’s award-winning documentary, The Education of Auma Obama, will take place on Wednesday, February 10, at the Nickelodeon Theatre in downtown Santa Cruz. It begins at 7:30 p.m. and will be followed by a Q&A with the director. Okpako will also show clips and discuss her film on campus Thursday, February 11, at the Humanities Lecture Hall as part of the Creative Writing Program’s Living Writers Series, beginning at 6 p.m. Admission is free to both events and open to the public. 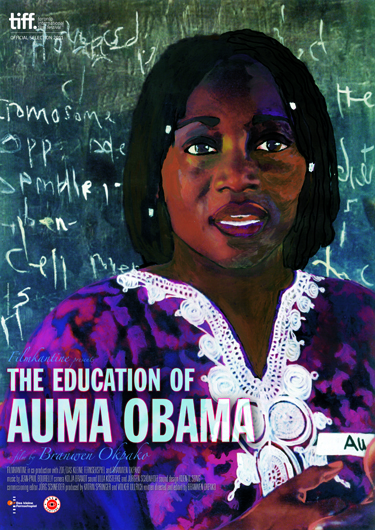 The Education of Auma Obama is a feature documentary film on the life and times of Auma Obama--told from her homestead in Kenya during the run up to the 2008 United States Presidential elections that brought her brother Barack Obama to power. Released in 2011, the film includes rare footage of a young Barack Obama and his family in Kenya. It received numerous awards, including the 2012 African Movie Academy Award for Best Diaspora Documentary, the 2012 Festival Founders’ Award for Best Documentary at the Pan African Film Festival in Los Angeles, and the Viewers Choice Award at the Africa International Film Festival in 2011. Okpako currently lives in Berlin, where she continues to make films and also works in theater--writing and directing plays. “The decision to study film came from a desire to combine all my passions: painting, telling stories and directing actors, all of which I had enjoyed doing since I was very young,” she recently observed in an interview with the African Women in Cinema blog. Okpako’s most recent project, The Curse of Medea, a docudrama about the life of the late German writer Christa Wolf, was screened at the Berlin International Film Festival in 2014. For more information, contact the Institute for Humanities Research, or call (831) 459-5655.